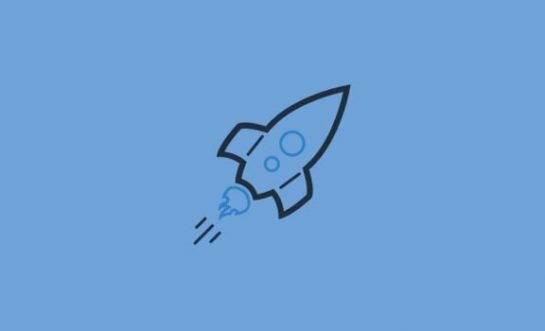 Science fiction allows artists to illustrate the ideas from their wildest imagination including futuristic cities, post-apocalyptic worlds, aliens and strange beasts, robots and biotechnology. 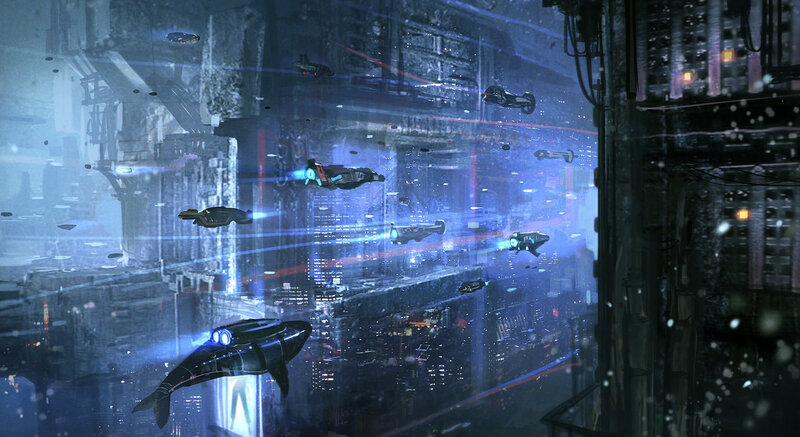 The most effective sci-fi art is rooted in reality so we can imagine it as a possibility in the not-too distant future. 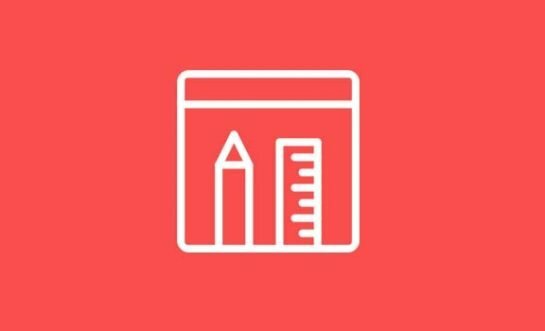 Sophisticated digital artwork software has made it possible for artists to create incredibly detailed and realistic depictions of the scenes they imagine in their heads. This amazingly detailed piece by rich35211 was developed in 3D Max, Vue, and Photoshop and took the artist between 20 and 25 hours to complete. Here we see a cityscape not so different from the big cities of today, apart from the giant skyscrapers shooting lasers and the traffic in the skies. An organically-shaped alien world by deviant artist Azot2017 that needs to be looked at full size to appreciate it fully. 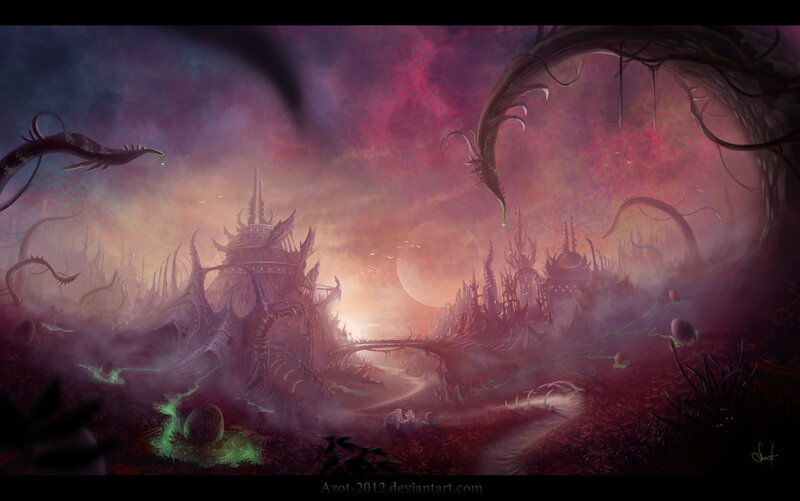 Alien eggs lit up by green light and bone-like paths lead to an alien city under pink and purple clouds. An artwork of two halves by Paullus23. 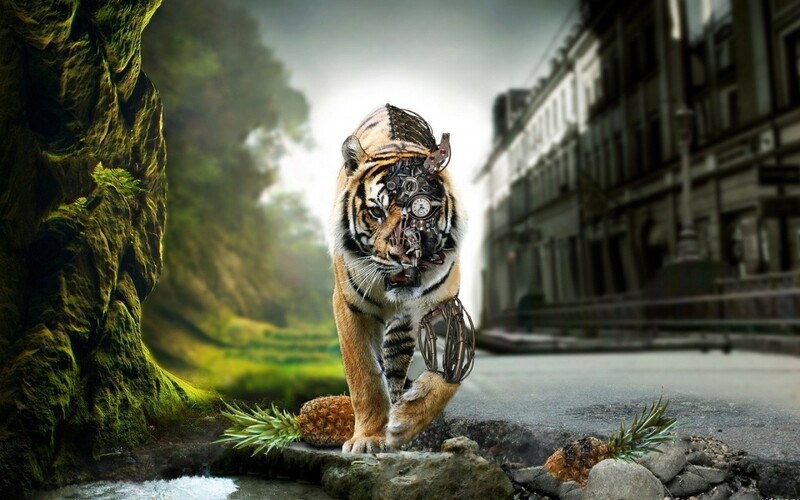 On one side we see an almost photo-realistic tiger in its natural jungle habitat and on the other, a mechanical robot tiger walking down an abandoned city street. 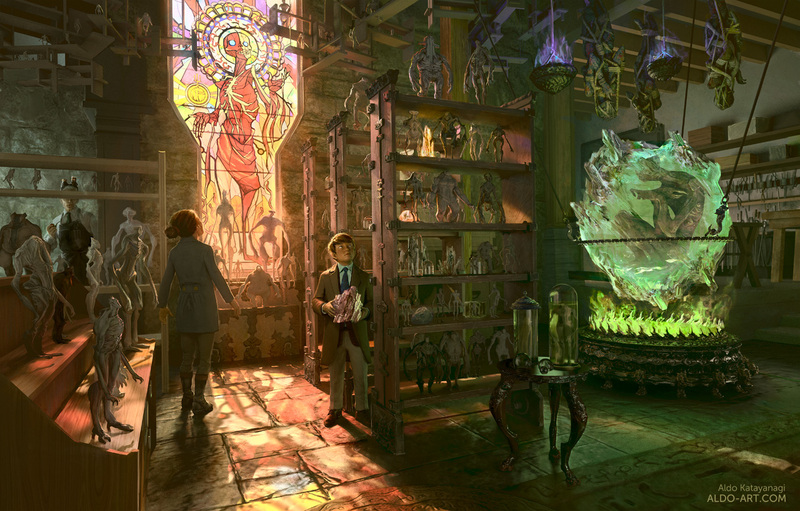 The backstory to this artwork by concept artist johnsonting is left up to the viewer. Perhaps the aftermath of a war or a plague, armed personnel in futuristic biohazard suits patrol a city in ruins. Amazingly, this piece took only 2.5 hours to complete in Photoshop with the help of image and texture layering. It’s not clear immediately that this futuristic city scene by nkabuto is set underwater, until you realize that some of the “air” craft are shaped like ocean-dwelling animals and the lights are casting beams in the murky depths. 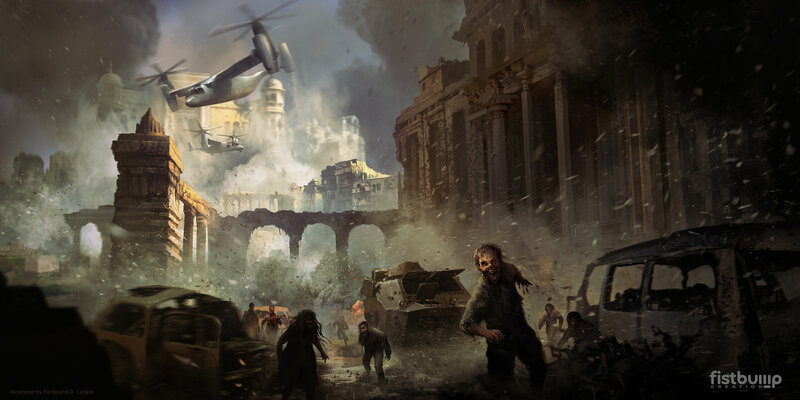 This concept art for computer game, The Realm, by Atomhawk is one of a series of artworks depicting a post-apocalyptic version of the UK city Newcastle upon Tyne. Locals will immediately recognize landmarks on the historic Dean Street and the Tyne Bridge in this image. Humans merge with robots in this horrific but beautiful image by hybridgothica (you can see lots of other work on a similar theme in her gallery). Reminiscent of the famous scene in Terminator 2 where the terminator is melting into liquid metal. 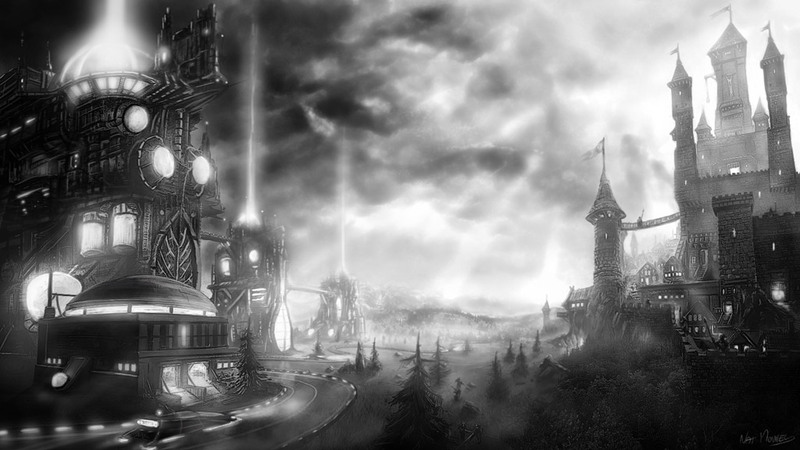 This stunning black and white piece by NatMonney depicts a world that is half medieval fairytale castles and half futuristic city. The artwork was created for the website of film and videogame composer, Mathias Winum. It’s common for futuristic landscapes to have a gloomy sinister atmosphere but not all artists see the future as something to fear. 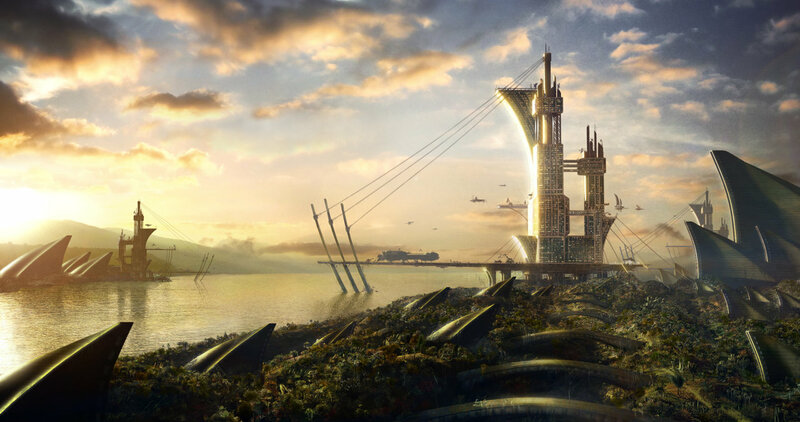 This artwork by Intercepto depicts a utopian city named after the artist’s son. As well as futuristic buildings and flying vehicles, this vision of the future includes blue skies, turquoise seas, and palm trees. 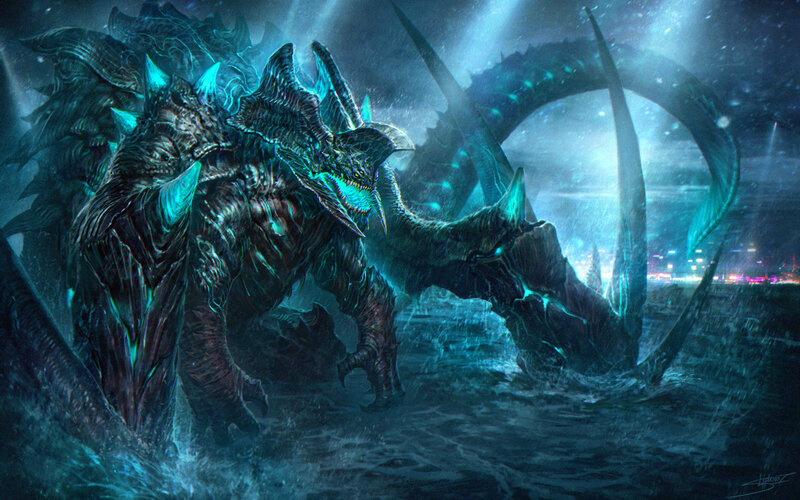 “Kaiju” is Japanese for “strange beast” and this terrifying sea-dwelling creature by NeoArtCorE definitely fits that description. It’s definitely worth zooming in on the full size version of this image to appreciate all the details and the city lights in the background could just as easily be a real-life modern city as it could someplace in another world. Unusually for this genre of art, this piece was created traditionally using acrylic paints and took the artist Love-and-mascara about two months to complete. Reminiscent of the works of H.R. 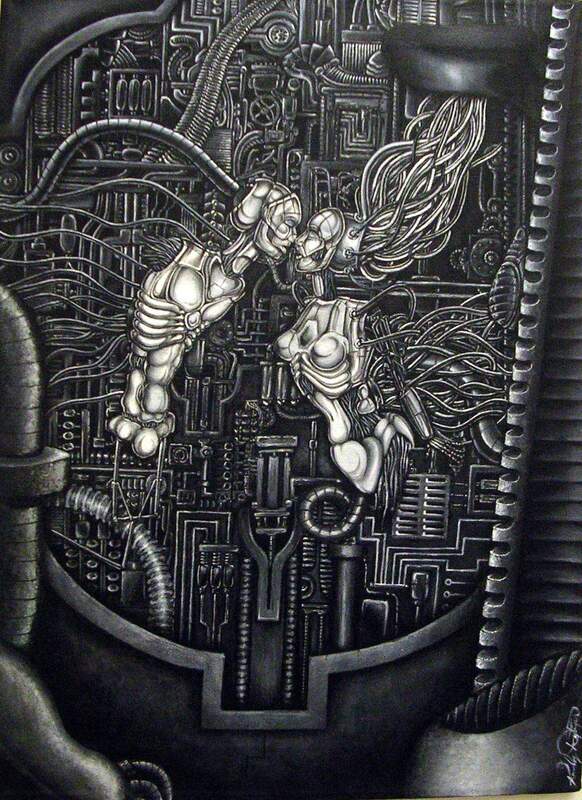 Giger, two humanoid robots are depicted in a romantic embrace against a backdrop of metal piping and circuitry. 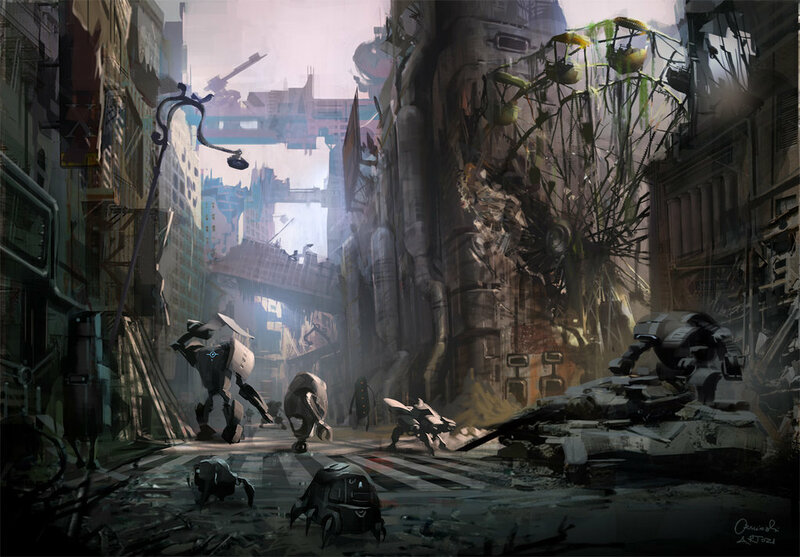 This digital painting by artozi depicts an abandoned and broken down city, occupied only by robots. The broken Ferris wheel acts as a reminder that humans once ruled here – a spooky vision of Earth’s future? Many scientists believe that alien life on other planets exists, it’s just that we’ve not found it yet. 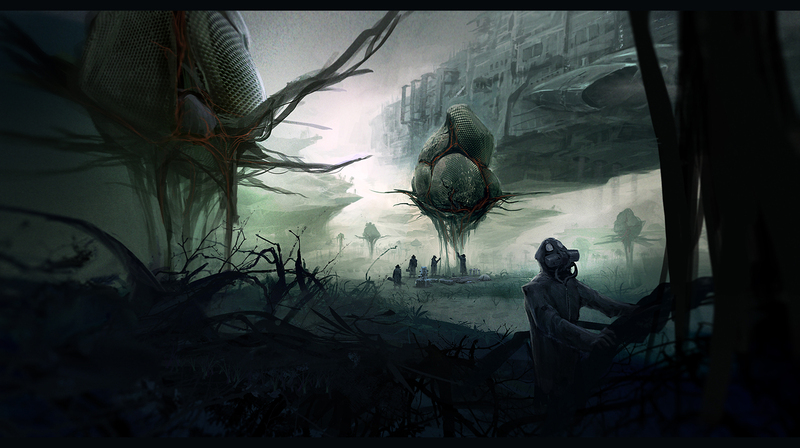 This atmospheric image by lapec shows humans wearing breathing apparatus examining the flora of an alien planet. 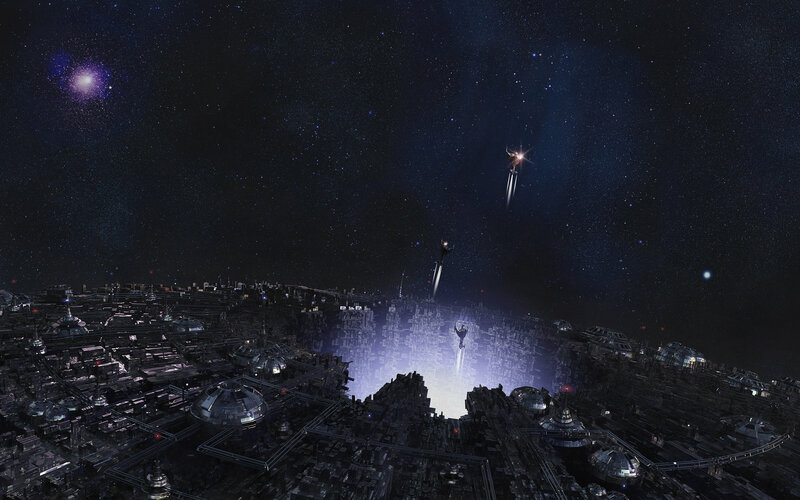 The idea of a “portal” that acts as a gateway to another world or dimension is a popular theme in sci-fi. This image by cat-meff shows otherworldly technology alongside nature as a human rides a futuristic aircraft alongside bird-like creatures. 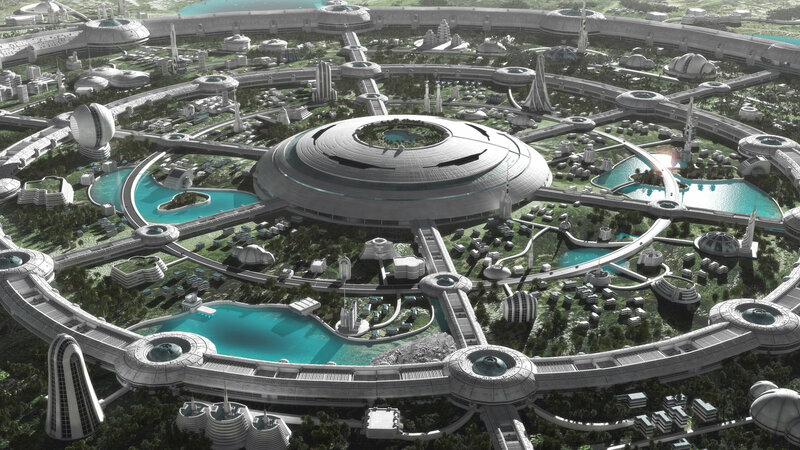 Is this the city of the future? 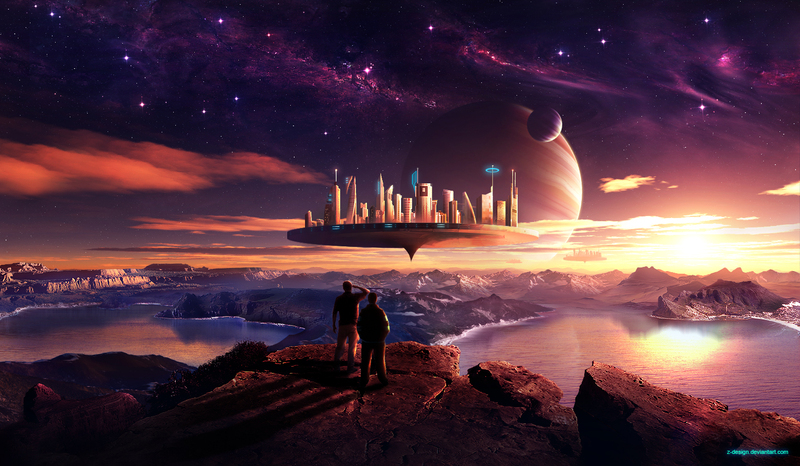 This digital art by jfliesenborghs shows a city designed to a utopian ideal. Man-made ponds and gardens separate organically shaped buildings that all connect to a central hub. 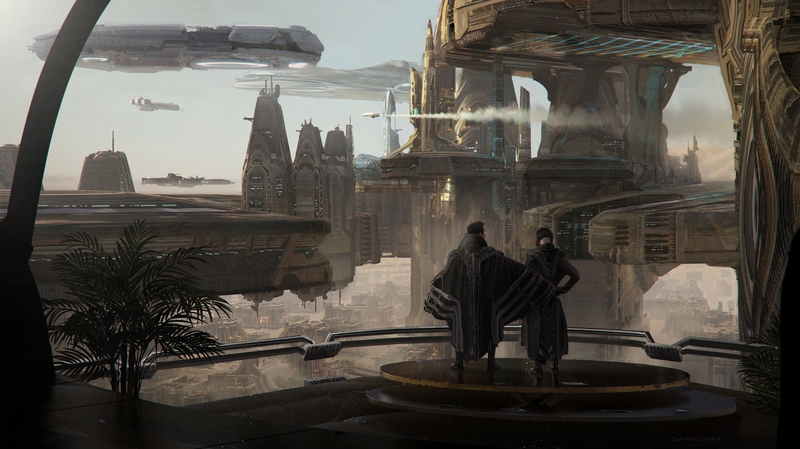 Many sci-fi artists like to imagine what life would look like on a planet other than Earth. This detailed piece by theLovas shows a civil research base on a partly terraformed planet located within the Sirius binary star system. Some sci-fi artists like to let their images speak for themselves and rely on the viewer to use their imaginations. Others, like crushvisual provide a whole backstory for the artwork. This image depicts the abandoned of a government initiative to use robotic technology in combat. 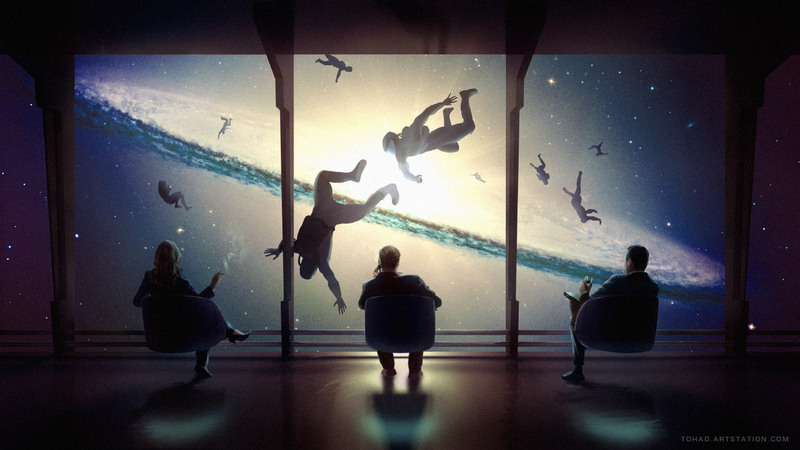 This surreal piece by Tohad was created as concept art for a video game and shows three people watching humans floating freely in space. 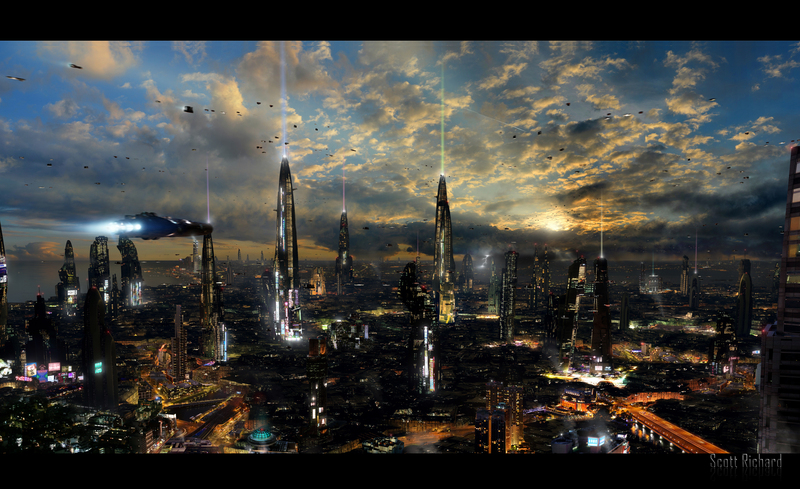 It’s always interesting to see how different sci-fi artists imagine how cityscapes will look in the future. This digital artwork by JonasDeRo depicts a highly populated city with jagged super-high-rise buildings and flying vehicles. Sci-Fi cityscapes are not always 100% imaginary. 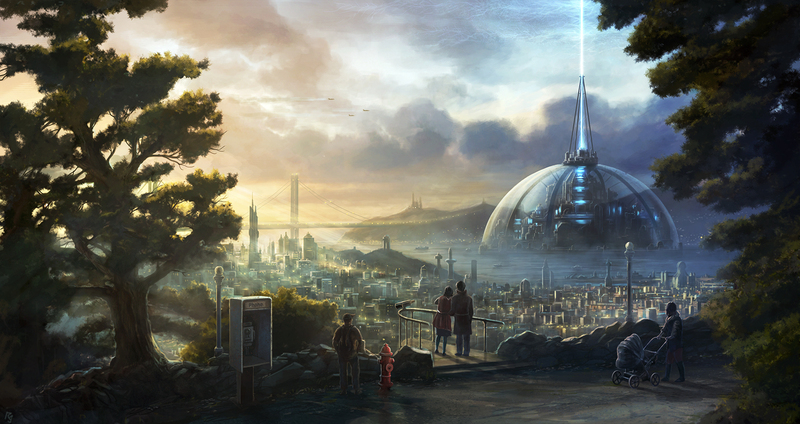 This beautiful digital painting of San Francisco in an alternate reality by RadoJavor is both familiar and futuristic. This atmospheric work by radoxist gives a peek into the artist’s mind and his imaginary future planet in a faraway galaxy. This piece was created with 3d Studio Max, Vue 5, and Photoshop. 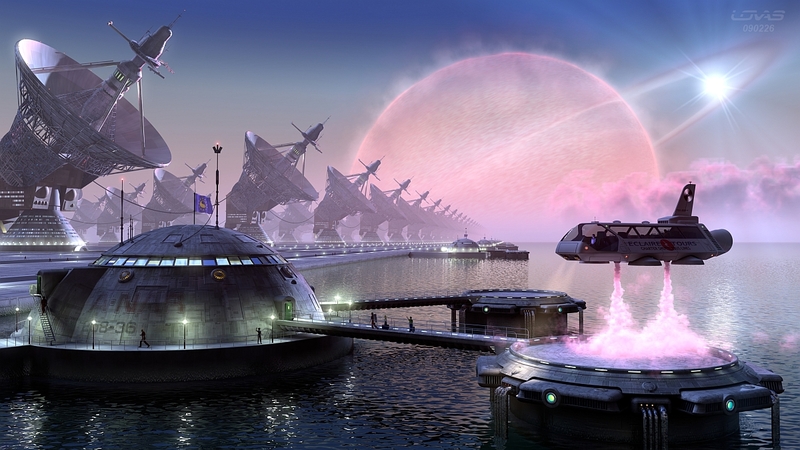 A floating city set on a planet in another solar system by z-design. Take away the city and the nebula and planets in the sky and this could be a normal sunset scene on earth. This amazingly detailed piece by jfliesenborghs is one of those amazingly detailed images that make you just want to keep zooming in. The scene was created in 3D Studio Max and rendered in Vray. Not everyone imagines other planets to be dark places with futuristic architecture. 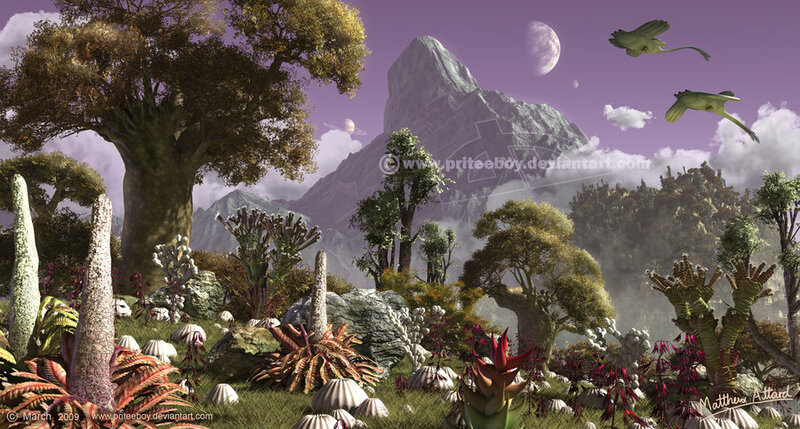 This scene by priteeboy imagines a lush and natural landscape with unusual plants and flying creatures. There’s so much going on in this picture by AldoK, you could keep looking at it for hours. It seems to be some kind of facility for growing or collecting alien life forms. 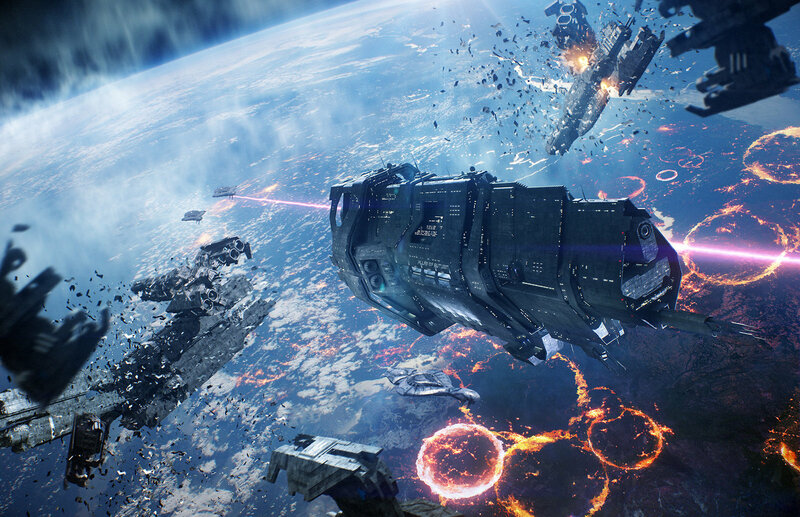 An epic battle going on in space by agnidevi, based on the Halo computer game. The detail on this one is really impressive and it’s worth viewing at full size. Sometimes sci-fi crosses over into horror and this image by Nikulina-Helena depicts one of those moments. 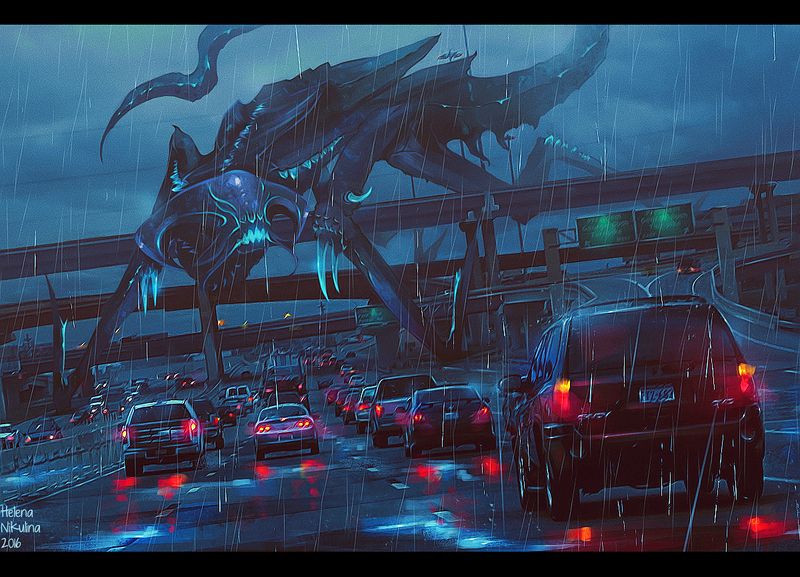 This is obviously a normal motorway from somewhere in the world today – not an alternate reality or future imagination, which makes the giant alien creature even more terrifying. Creating with a limited color palette can be really effective and this futuristic scene by Scharborescus demonstrates that perfectly. The framing of the large window makes the viewer feel like they are actually inside the scene. A futuristic military scene by FLOWERZZXU could almost be a scene from today’s reality if it wasn’t for the giant flying robots. A sci-fi image set in an ancient forest by sarichev. This is a very organic image containing humans and nature but it’s obviously a sci-fi theme even without the inclusion of any obvious technology. Some of the most effective sci-fi artwork comes from the simplest concept like this image by artist Wen-Jr. 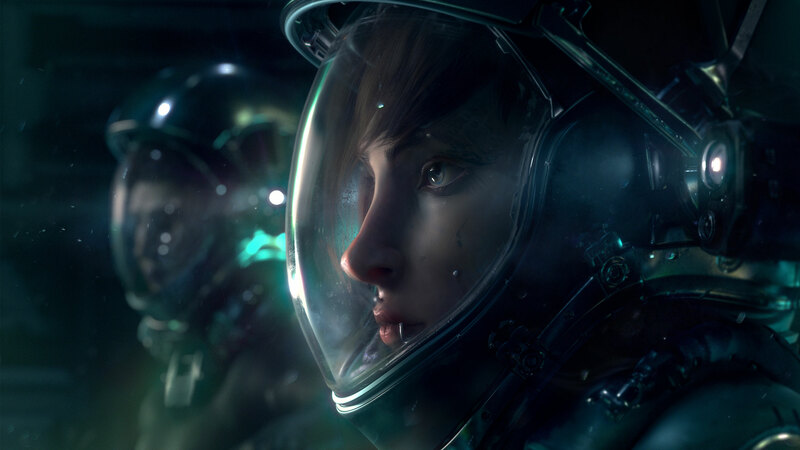 The subject is basic – a woman in a space suit, but the attention to lighting and detail makes it a really extraordinary work of art. If a zombie apocalypse happened, it would probably look something like this scene by FerdinandLadera. 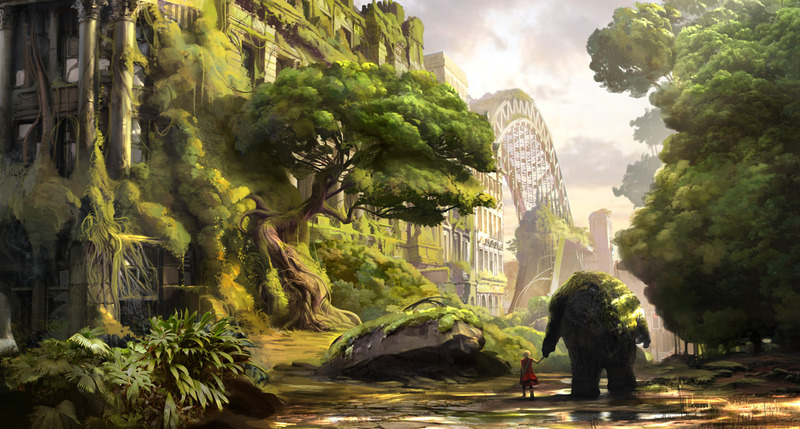 This detailed digital painting was created as concept art for Fistbump Creation Studio. It’s left up to the viewer to decide what’s happening in this atmospheric piece by emanshiu. 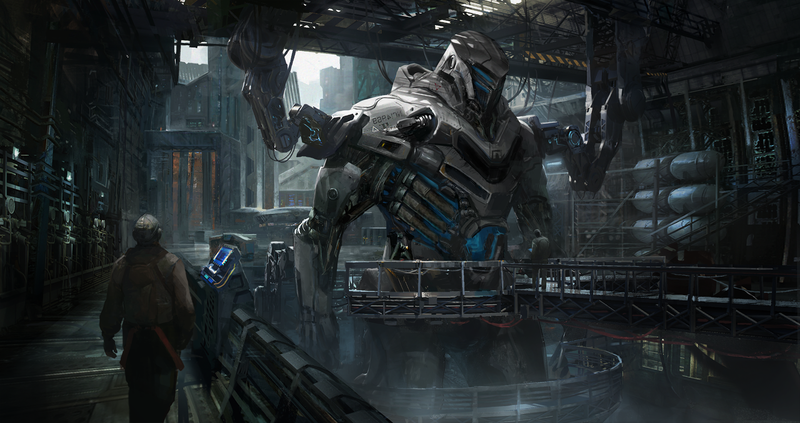 It’s the unusual machine in the background and the character’s outfit that makes this artwork fit into the sci-fi category, showing again that successful sci-fi artwork is all about the little details. Nobody knows what aliens look like so it’s up to the artist to provide their own interpretation. 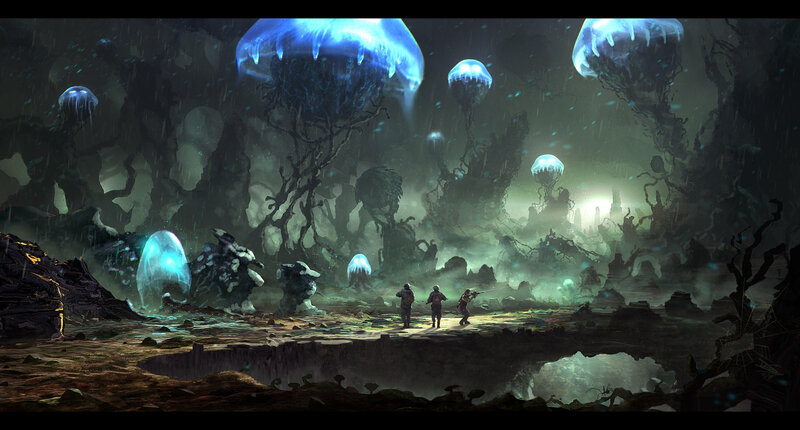 This artwork by DominiquevVelsen uses a common idea of alien ‘pods’ alongside jellyfish-like organic shapes. The human soldiers in the foreground make the scene all the more unsettling.